The Outdoor Adventure View, or OAV Tarp, is a budget-minded nylon rain fly that can be used with hammocks, tarp camping, or on its own as a sun shade. It’s ideal when pitched as a rectangular tarp, but it can be turned as a diamond for extended side coverage. It has a strong 5,000mm PU coating and is made from 40D ripstop nylon and has tie-outs on all four corners and on the main ridgeline. Each tie-out features line locks for rapid adjustment. Grosgrain ribbon is used around the perimeter to edge and finish the tarp. The tarp comes complete with guy line and stakes. Fabric: 40D ripstop nylon with a 5,000 mm PU coating. Taped seams. When I get a square tarp, I really want to have at least eight tie-out points: one on each corner, and one at each mid point. This provides a lot of pitching options. However, the OAV tarp is limited to only six. While you can retrofit and add more tie-out points, it’s a shame that this tarp doesn’t include them stock. That said, there is still a lot you can do with the tarp. 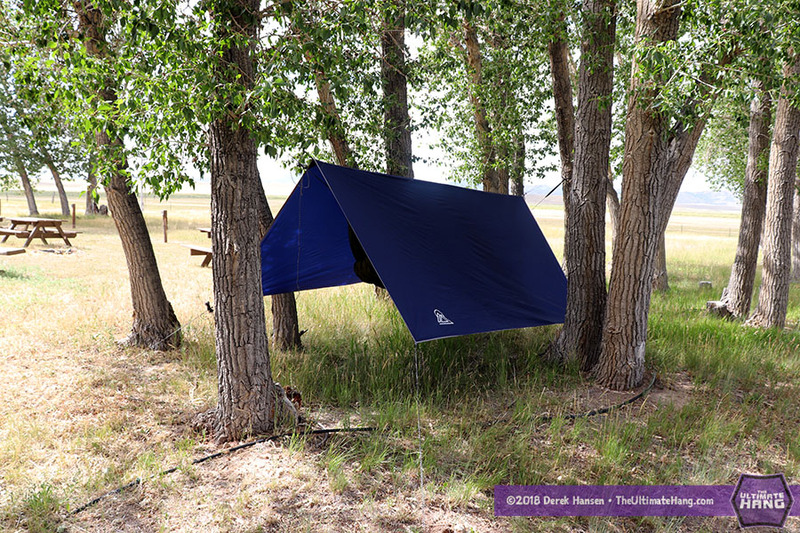 The rectangular set-up is standard and provides a good ridgeline protection that will fit most hammocks, although it’s a tad shorter than most folks really like for hammocks. For longer hammocks, a diamond pitch will be preferred for best end coverage. If your not a hammock camper, than the ridgeline will not be a problem at all. I’m not a big fan of line locks on the ridgeline. First, it’s not apparent how to easily connect the line around an anchor point (like a tree) without tying a knot. Second, the strain on the ridgeline is sometimes more than the line lock can hold and it can slip. I don’t mind the line locks on the guy points, where a simple loop connects with the stake and then all the adjustment is done at the tarp side. The tarp is dark, which can be nice for sleeping in on mornings when the sun gets up earlier than you want to. Overall it’s a good tarp with adequate coverage at a good price. Suspension and Anchor System ★ ★ ★ ★ ☆ The tarp comes with guy line and line locks on each tie-out point with 6 aluminum stakes. The line is a little stiff to work with. Construction and Craftsmanship ★ ★ ★ ☆ ☆ Mass-produced, but even stitching and clean look. Modularity ★ ★ ★ ☆ ☆ As a basic tarp with limited tie-out points, you can pitch it as a rectangle or diamond. I wish it had more tie-out points. Aesthetics ★ ★ ★ ☆ ☆ Comes in blue. The brand logo is nice and small. Price and Value ★ ★ ★ ☆ ☆ For a standard tarp with lots of coverage and good weather protection, I think the price is a good value.